This paleo coleslaw is refined-sugar free, but sweetened with raw honey and its tang is from raw apple cider vinegar. In a small saucepan, combine the dressing ingredients and heat on medium-high heat, bringing the mixture to a boil, then reducing the heat to low and simmer for three minutes. 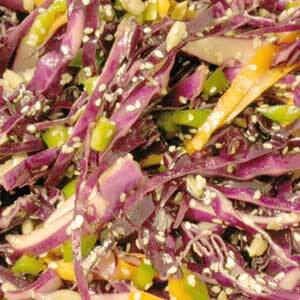 Combine all the coleslaw ingredients except for the seeds, and pour dressing over to evenly coat. Cool the coleslaw in the fridge, and allow the dressing to infuse the coleslaw for at least one hour. Sprinkle the sesame seeds and sunflower seeds, and toss lightly before serving.